Regulations, if created correctly, can help innovation, what institutions have to find is the right balance between experimenting new ideas and meeting regulatory regimes, according to a panel at the Global WealthTech Summit 2018. There has been an unprecedented level of regulation in the market since the financial crisis in 2008. Due to this, financial institutions and RegTech companies have put a lot of resources into developing technology solutions to keep up with the changes. Regulators around the world have been working tirelessly to foster the evolution of the market. There have been a number of collaborations with regulators in different countries to aid development across regions. An example of this is the Global Financial Innovation Network (GFIN), which was launched earlier in the year, by the UK regulator Financial Conduct Authority (FCA) with a goal of enabling companies to test products in multiple countries. The group is made of 12 regulators including the US Bureau of Consumer Financial Protection, the Monetary Authority of Singapore and the Hong Kong Monetary Authority. When utilising new technology like blockchain or AI, it can be hard to innovate and keep compliance. 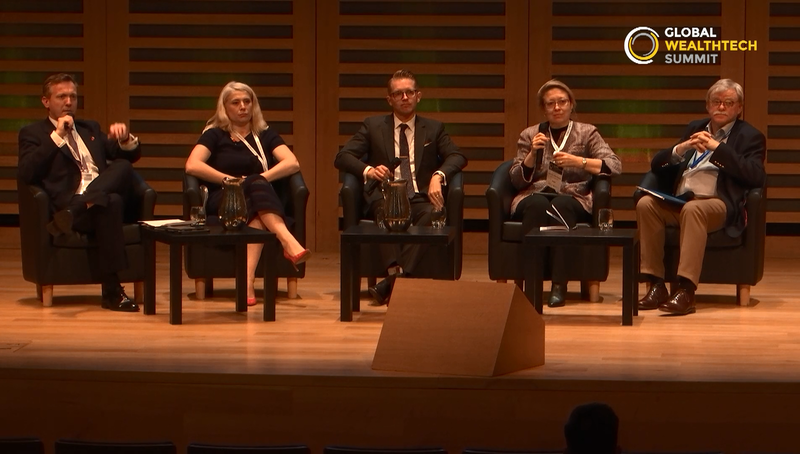 The panel at the Global WealthTech Summit which included, senior staff from the Financial Conduct Authority (FCA), AutoRek, ThetaLake, Aviva Investors and ObjectWay, discussed how regulatory challenges can be overcome and identifying new opportunities. The overarching opinion to come from the discussion was that regulations do help innovation in the market, if it has been created and implemented well. The key challenge for financial institutions is to find the right balance between experimenting while still maintaining the necessary compliance requirements. Interest in the space is clear from just the level of capital being invested into the space. Funding into the sector has witnessed a colossal increase during 2018, with it doubling the volume deployed in the whole of 2017, according to data by RegTech Analyst. During the first three-quarters of 2018 there was a total of $3.7bn invested to RegTechs. One of the questions pitched to the panel was whether regulations are hindering innovation with technology. Regulations help all players in the market, not just startups but also large international enterprises, to innovate and adapt. They can boost trust with customers or interact with new parts of the market. It takes time for regulations to be fully implemented, and in an ideal world, they would-be set-in stone before you start experimenting. However, regulators, like the FCA, are helping to overcome this through sandboxes or support programs where they can partner with regulators and experiment. UK regulator Financial Conduct Authority (FCA) has a number of initiatives in place to help companies and institutions create solutions to meet compliance. One of these is a regulatory sandbox. The FCA innovate head of department Anna Wallace believes all firms can utilise it to get support directly from the regulator and test products and services in a controlled environment. Whether it’s a startup looking to launch its solution, an international player trying to break into the market, or a large organisation developing new technology services, the sandbox helps to aid their journey. By taking a technology neutral approach, the FCA looks at what outcomes a company is trying to achieve rather than having rules around new development like distributed ledgers or blockchain. While this is a good stance to, sometimes it’s hard to stay along this route. Things can inadvertently be made more complex by using technology like machine learning if proper thought hasn’t been put into its new capabilities, and this can have knock-on effects to compliance. Taking initiative by testing new technology before regulations have been fully ironed out, was largely agreed by the panel. It’s much better to get a head start and create a solution, rather than sit back and wait. Getting involved with regulators is the best way to make sure new developments are compliant or they can use general examples or existing principles in regulations to mould their services. An example he provided was if a company wanted to start using video conferencing for communications between advisors/wealth managers and their clients, but there aren’t any clear requirements around it. If they are waiting for everything to be clear and outlined, they may choose to not implement video conferencing. If a client only wishes to communicate via videos, they have then hindered their own growth. The key is to make sure you acknowledge any principles in the market and use that to build a solution. If new regulations are implemented later, its simply a case of adapting the solution to meet the new requirements. Aviva Investors global chief compliance officer Camille Blackburn stated that regulations both do and don’t hinder innovation, but overall it’s good to be in a regulated market. The reason why wealth management is a heavily regulated market is down to the level of incidents there have been. All players in the financial services market are aligned with regulators as the whole industry relies on trust of consumers and regulations is what help to build this. However, one area which Blackburn did feel regulations hindered innovation was where there are very detailed or old regulations. Old regulations are typically not innovation friendly, but these are slowly being updated and solved. It’s the over-detailed regulations that cause the issues. These ones require players to meet requirements in a very specific manner, which in turn, means free thinking and new ideas are much more restrained. While keeping up with regulatory developments is hard, Wilson also believes that its hard to get firms to spend money on technology. Instead of getting in solutions to handle the regulations, they are hiring more staff to help meet the varying needs of the regulations.